At least 215 species of woodpeckers exist worldwide. Most of the birds in the woodpecker family exhibit similar characteristics and behaviors, although each species has its own distinguishing qualities. 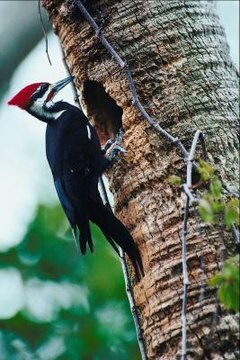 You can discern a woodpecker from other birds by observing typical patterns of coloring -- for instance, a red or yellow head -- and noting whether the bird has a long beak, a coarse voice, and behaviors of hammering and climbing on trees. Most woodpeckers have black and white feather patterns with patches of red or yellow on their heads or breasts. Spotted, striped and barred feather patterns help camouflage them in their forest habitat. Exceptions, the chestnut-colored woodpecker of Mexico and Central American is brown, and Lewis's woodpecker, found in British Columbia and the western United States, has beautiful green-black wings, tail and head with a salmon breast, red face and gray collar. Woodpeckers have strong beaks and powerful necks to help them drill into trees, cacti and soil to find food. They drill into trees to extract wood-boring insects, and their hammering noise can be heard for miles. Hammering woodpeckers have thicker, stronger beaks, while woodpeckers who use their beaks for probing have longer, thinner, more curved beaks. Also, woodpeckers have long, sticky, barbed tongues that extend beyond the beak to use during insect extraction. To aid in climbing and clinging to trees, woodpeckers' feet and tails have adapted. Most woodpecker feet have two toes pointing forward and two toes pointing backward. Other birds have three toes pointing forward and one toe pointing backward. This adaptation helps woodpeckers climb up and down plants, facing either upward or downward. Such toe placement assists them with balance during drilling, too. Woodpeckers' tails have sharp spines within the tail feathers that help them brace while they drill for food. Woodpeckers range in size from small to large. The downy woodpecker is the smallest, at about 6 inches long. The downy is common throughout the United States and Canada. Some of the larger woodpeckers include the pileated woodpeckers, redheaded woodpeckers and Lewis's woodpeckers. Most woodpeckers average around 7 to 9 inches long. The imperial woodpecker and the ivory-billed woodpecker, which measure about 19 to 24 inches, are thought to be extinct. The voices of woodpeckers tend to have a loud and rattled pitch to match their loud hammering activity. One exception is Lewis's woodpecker, which rarely makes any vocal noises. Many woodpeckers make chuck-chuck-chuck noises or a repeated churrr. Some seem to scold each other or give warnings with loud rattling noises.